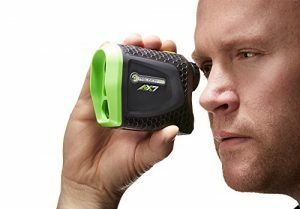 Precision Pro recently came out with their latest rangefinder, the NX7 which replaces last year’s Nexus. We recently had the opportunity to review it, and here are our initial thoughts. Right away out of the box, we loved the rigid case it comes in. Easier to open and close than the case for the Nexus, the NX7 easily slides in and out for quick access and put away. Once you get it out of its case, you’ll notice the color scheme; the black and neon green is a sleek combo. It fits the personality of this rangefinder because it is actually a sleek design in other aspects. It is really nice and compact and will fit into your pocket during shots. That is a big plus in our mind. The outer layer is made of rubber that is nice a grippy but also really durable. We have no reason to disagree with Precision Pro’s claim that the NX7 is both water resistant and shock proof. We spilled liquid on it and it still worked. We dropped it on purpose and it didn’t phase it. The weight is just over 7.5 oz, which we liked. This is a very well made rangefinder and we predict it will last you for many years. Overall the NX7 scores really high ergonomically and on build quality. Now on to the function of the NX7. It is very simple to use; push the power button once to turn it on, push it again and the Target Acquisition Technology starts its magic. In less than a second, it has scanned the field of view and locked in on the object you are targeting. A separate mode button toggles between yards and meters. Measuring is done to the tenths and accuracy is +/- 1 yard. It has a range of 400 yards and a 6X magnification (more than other leading brands). After about 8 seconds of inactivity the NX7 will automatically power off on its own. 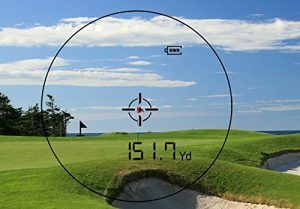 A product that is this easy to use, accurate, and is quick to give you results will improve your pace of play and overall enjoyment throughout the round. Also, it is worth noting that the NX7 has a 2 year warranty and has a free battery replacement. All of this adds up to the conclusion that the NX7 really is a wonderful value for the price. It is light, compact, simple to use, rugged, and has technology that higher priced brands have. Overall, it is an improvement over the Nexus, and you really can’t go wrong with it. Buy Now on Amazon for $199.99! ‹ Can a Golf Simulator Take Your Game to the Next Level?